The SGI-USA has provided a variety of publications on Nichiren Buddhism for more than 50 years. In 1964, when Buddhism was relatively unknown to English readers, the World Tribune newspaper was first published. The World Tribune, a weekly newspaper published by the SGI-USA features organizational and world news, experiences by SGI members and a variety of articles relating to Buddhist principles. Subscribers in the United States have their choice of the following language supplements, free of charge: Japanese, Korean, Chinese and Spanish. Please visit the WorldTribune.org news site for more features from the World Tribune and Living Buddhism! 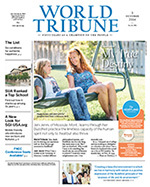 Interested in submitting an experience to the World Tribune? Please see Guidelines for Submitting Articles to the World Tribune. You can send your comments or questions about Living Buddhism to the editorial staff at lb@sgi-usa.org. Subscribe to the World Tribune and Living Buddhism or for more information call the Member Services Center at 1-855-SGI-2030/1-855-744-2030 or email Subscriptions at subs@sgi-usa.org.